Thanks to AToMR Tours, we're pleased to present a review for a brand new YA paranormal book, Reaper's Novice, by Cecilia Robert. Keep scrolling to check out our review and then enter to win all sorts of swag for yourself! Also, make sure you check out the other stops on the tour for more reviews and excerpts from Perception and its new sequel, Volition. 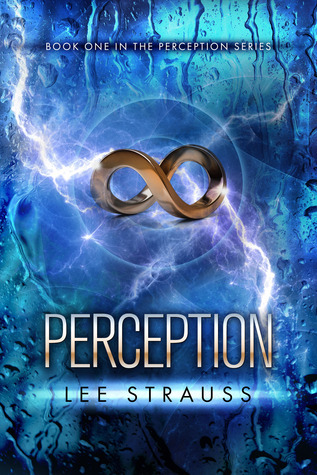 Perception starts out normally enough -- there's a young, beautiful girl who has an equally beautiful brother. They are pretty, and wealthy, and do all the things that pretty, wealthy people do. I'd kind of forgotten what this book was about at first, I just knew it was next on my list of stuff to read, so I was kind of annoyed by Zoe's entitled attitude, until we realize that she is a GAP, a Genetically Altered Person. These people are typically incredibly wealthy, have every opportunity possible in life, are genetically designed to be as beautiful and smart and appealing as possible, etc. GAPs all live inside a walled-off city, so they don't have to mingle with the naturals, people who can't afford the GAP procedure (or object to it). So at least there was a reason for her attitude, although it is hard to have your main character be someone who looks at the "household help" with revulsion. I really liked the worldbuilding that Strauss does in this book. It's set in the somewhat distant future, and though it doesn't exactly paint the prettiest picture of society, I could see it that sort of misuse of technology by very powerful and wealthy people as something that's plausible. While Zoe starts out as being very closed-minded and judgmental towards non-GAP people and lifestyles, she does come to grow and change over the course of the book, which makes her easier to like. I would have liked to get more background on Zoe and Liam and their relationship. Her search for her brother is what drives the plot, but we really only see them together in one scene of the book. We're told that they're really close, and we believe it because we believe Zoe, but I think it would have been nice to see them interact a little more. One thing I was not expecting was the emphasis on science vs. religion. It felt heavy-handed sometimes, especially when Zoe and Noah discuss their differing points of view. I wouldn't call this Christian fiction, since it's not the focus of the story, but it's close when it becomes clear how many of the people associated with the science end of the story are bad guys. Fine if that's your cup of tea, but I just wasn't expecting that to be the backbone of the story. Otherwise, I feel like this book has the same sort of issues that I feel happen all the time in YA books: somewhat obvious villains, uber-fast-moving romance, some stilted/unrealistic dialogue, at least one moment that makes you go "WAIT WHAT?! ", etc. At least Noah isn't the bad boy type who treats Zoe like crap, and although he does make some questionable decisions in the back half of the book, he at least has the self-awareness to know that what he's doing is pretty weird. They weren't showstoppers of issues -- I still enjoyed the story -- but just know they're there. Overall, I was pretty entertained by this book and wouldn't mind checking out the later books in the series to see what happens to Zoe and her quest for truth. There is some violence and one very brief medical/surgery type scene. There is romance but it never goes any further than kissing. I have this novel on my TBR list. Your review has intrigued me even more to get it moved up my list...a really long list lol!! !